As the Senate chair of the Labor, Commerce, Research, and Economic Development Committee, I was more than a bit surprised to read Rep. Dillon Bates’ version of last year’s minimum wage debate in his March 14 BDN OpEd. Bates also serves on the committee with me and while he represents his constituents in Westbrook with distinction, I feel compelled to set the record straight. Last year, prior to the legislative session, I met with representatives of the Maine State Chamber of Commerce and the Retail Association of Maine. One of the issues we discussed was the minimum wage and whether I thought a reasonable increase to the minimum wage could get passed during the coming legislative session. While this issue is controversial, I thought a modest increase in the $9 to $9.50 per hour range was possible. 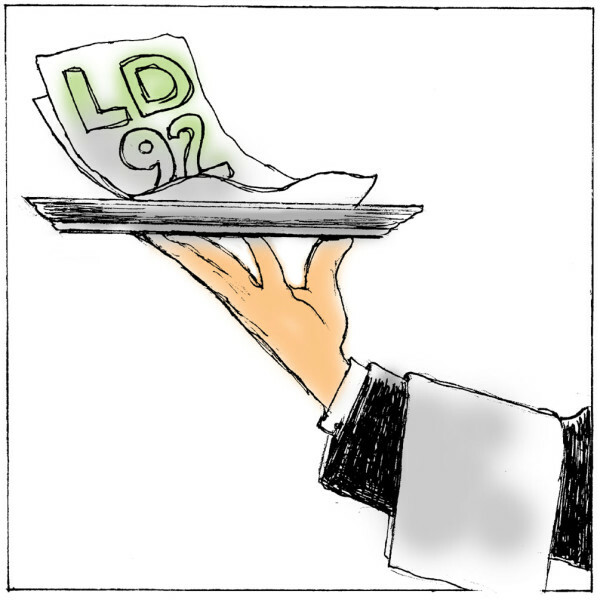 When the legislative session started, there were eight separate bills to increase the minimum wage, plus another that simply looked to eliminate the “tip credit” that impacts restaurants directly. The tip credit bill, LD 403, had a robust public hearing during which many restaurant owners and servers testified that while they supported a modest increase of the minimum wage, but they believed changing the tip credit was a very bad idea. The committee, including Bates, voted unanimously against the measure. It was clear that everyone on the committee was in agreement that eliminating the tip credit was poor public policy. The eight other bills related to a minimum wage increase had their public hearing about a week after the vote on the tip credit. It was obvious the various bill sponsors could not agree on what the appropriate minimum wage amount should be. In that mix of eight bills was LD 92, sponsored by Bates. As originally drafted, LD 92 proposed a one-time, 50-cent increase to $8.00 for the minimum wage, with no indexing and no change to the tip credit. I was impressed with Bates during his presentation of his bill because he remarked that part of the reason he put forward such a modest bill was that, because of conversations with many of the small businesses in his district, he felt that a moderate increase was a good compromise. When there are multiple bills on the same topic that come before the Legislature, a committee will sometimes whittle the bills down to one bill to provide a vehicle to bring the issue to the House and Senate floors. Since Bates serves on the committee, my co-chair, Rep. Erin Herbig, and I agreed that LD 92 would be the primary vehicle to advance on the minimum wage issue and that this bill would be amended by the committee. In between the public hearing and three subsequent work sessions, we continued to discuss a compromise to the minimum wage with Herbig, members of the business community and other interested parties. We ultimately ended up with two proposals to increase the minimum wage. The Democrats proposed an increase to $9.50 while some Republicans were supportive of an increase to $9. The Republican version also included provisions to allow more young people to work in establishments such as movie theaters and bowling alleys to get important entry-level experience. While I think that we could have ultimately come to an agreement on $9, $9.50 or even split the difference to $9.25, the Democrats were unwilling to compromise on the other portions of the bill. It is also not true that the Maine State Chamber of Commerce and other groups were working to kill the bill in the Senate. They made it clear they were supportive of an increase. So, here we are almost nine months later with a very bold and thoughtful proposal from the business community to raise the minimum wage to $10 per hour over four years. This proposal should be given strong consideration by all legislators because it represents the most reasonable path to get a minimum wage increase passed. Instead, some are willing to gamble on the overreaching proposal from the Maine People’s Alliance. It would be a shame if policymakers passed up the best opportunity to get this issue done for the people of Maine. Sen. Amy Volk, R-Scarborough, is the Senate chair of the Labor Commerce Research and Economic Development Committee.